Save Trestles: Department of Commerce Hearing Events Update. Due to the postponement of the Department of Commerce hearing at the UCI Bren Center we decided to postpone our "Hands Across the Toll Road" event scheduled for this Saturday, July 19th. This event is geared toward drawing attention to the importance of attending the Dept of Commerce hearing--and we want to hold this event in conjunction with the hearing. Since the hearing date/location is still up in the air, we are holding off on this demonstration until the Federal Government confirms a new location. 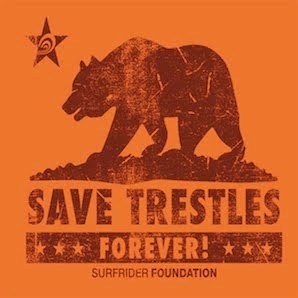 Don't forget... about all the work Surfrider Chapters are doing to raise awareness about the Trestles campaign. Many Surfrider chapters have events planed in local communities to raise awareness and inform people about the change in the venue of the public hearing. Please double check your local Chapter website for more details. I added the official letter to bottom of the post. While it takes a lot of energy to ramp up, there is a tremendous level of interest and energy in the community. People REALLY don't want this road, so I fully expect that we won't have any problemms once the new hearing is scheduled. Just keep up the pressure, write letters to your local paper and speak out when given the opportunity. Why is the website called Save Trestles? Trestles isn't threatened. I surf and I love Trestles, but it is very misleading to say that Trestles is at risk. The toll road will reduce traffic and improve the lives of millions of working people who use the 5 Freeway on a daily basis. What wrong with that? Let's get the facts straight here: The vast majority of the general population wants the toll road built because it would reduce traffic in South Orange County. The opposition to the Toll Road is a very-well organized tiny minority using scare tactics to convince the public that Trestles is somehow threatened. I think we should re-name this website: More Traffic, More Congestion, Cripple Our Economy so that a trout can swim un-impeded up Santa Mateo Creek. That's strange, I have yet to meet one person in my area who wants the toll road to be built. If I ever meet you, you will probably be the first... I find that a majority of the community in these beach cities is strongly and actively against the toll road. We want to preserve what little natural beauty our coasts have left. It makes sense that out-of-towners complaining about their commute would want their lives to be easier, but the truth is - our land deserves to be preserved, and we aren't going to let impatient commuters ruin it. If you are really that distressed by traffic then maybe you need to sort your life out instead of ruining our coasts. He or she also can't read maps, 'cause if they could they'd see their much pimped 241 doesn't go anywhere. Back when the rich Republicans in Newport Beach knew for certain El Toro was gonn'a become an International Airport, the 241 was 'sposed to carry North San Diego's burgeoning population up here to fly out. Check the map, trace a tiny pencil line from 241's giant gash in the foothills right into El Toro. Didn't matter that all it did after that was dump traffic onto the 91. But now TCA is stuck with pretending that was their plan all along. Check the toll revenue, Anonymous. The 241 is toast! We all know that toll-road is just so greedy developers can get a road put in to their planned development. Sorry, but I'm so sick of tax-payers bailing out stupid government and big business schemes. Hate traffic - you're the cause. There are many alternate solutions to reduce congestion - with gas at the price it is and rising, we as spoiled Americans need to change our ways. Instead of wasting time and resources trying to improve the roads we should be pressuring for more public transportation. I don't hear the 8 million residents of NYC whinihg about traffic -because its always there; most people don't own cars they use the subways. Use alternate transportation - ever heard of the Coaster or Surfliner? Carpool, vanpool, bus, bike. Why should the tax payers foot the bill because you choose to live 20 miles from where you work. We all have to make sacrifices when it comes to choosing where we live. Would we all like big houses with yards and live close to work? YES! but wake up we live in So Cal - its not going to happen. We need to stop whinig and start being more proactive. Have you ever driven on the I5 at 6 am? There's not that much traffic - go to the gym before work! What do you dislike more waking up early or traffic? Individuals need to change their behavior; get out of your So Cal bubble and see how the rest of the world functions! A more expansive public transportation system will provide more permanent jobs than building a toll road. That contract is over in 5 years and needs minimal maintenace after that. Public transportation provides permanent jobs for people! 1. Monday-Friday the north-bound traffic in Orange County becomes snarled at Crown Valley Parkway. Why? Because the Communities east of the 5 out to the 241 are attempting to get to the 5 and avoiding the 241, because the greatest centers of commerce are in Irvine and north along the 5 and 405. How could an extension of the 241 help relieve this traffic if it would take north bound traffic out of the way of its destination? It can't and it won't. 2. Weekend traffic - If you live in San Clemente you are well aware that during the summer months the worst traffic is going south towards San Diego, not going north. Therefore, the 241 extension would only feed more traffic into the 5 exacerbating the already existing bottle-neck. The only logical reason I could see for a 241 Toll Road is to eventually service the development of the Mission Viejo Ranch - which is slated to build 16,000 units on the land directly behind San Clemente. If I were developing that land I would want that Toll Road too. that would establish less traffic less pollution and a very good alternative to the problem. But the problem is the toll road is set up for only a few private people to make milliions from this deal. That's why they are so adament about winning. The vast amount of people in the area think it is a stupid wasteful project and do not want it.